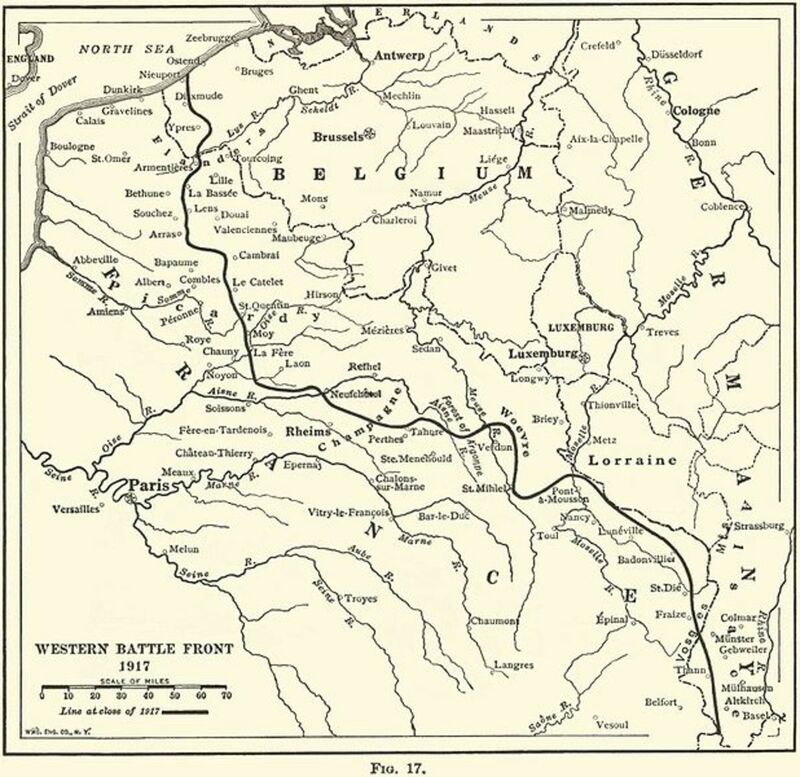 After several months of maneuvering, the armies on the Western Front during World War 1 dug a system of trenches that stretched from the English Channel to the Swiss Alps; each side separated from the other by a contested area called No Man's Land, which varied from 30 yards to hundreds of yards across. As the soldiers tried to adapt, they discovered that the weapons they had been issued were sometimes not the best suited to this new and hellish environment. Many times adaptations were made to obsolete weapons of types ranging from Medieval times to the Napoleonic wars. 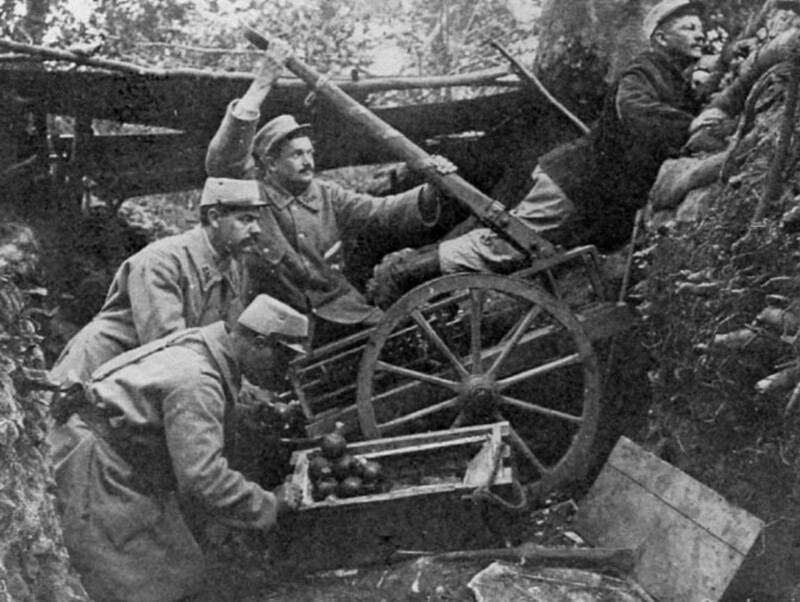 The Germans had closely observed the Russo-Japanese War of 1904-1905 and took note that mortars and grenades, considered militarily obsolete back then, were used to great effect against the entrenched enemy, with grenadiers hurling their grenades into enemy trenches so that supporting infantry could storm the trenches and mop up any survivors. 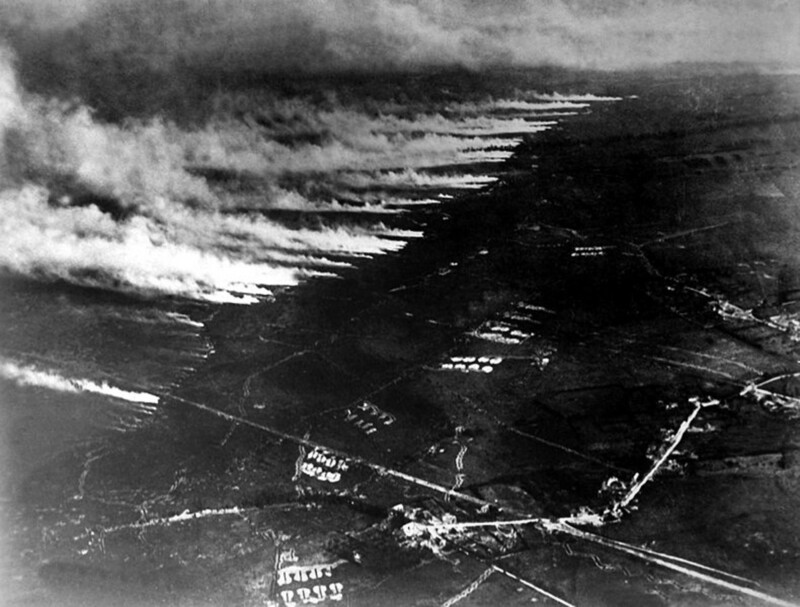 Although their military planners weren't envisioning a stagnant entrenched front stretching hundreds of miles, the Germans did anticipate laying siege to French fortresses, and grenades would be very useful in this regard. Consequently, when they went to war in 1914, the German's had tens of thousands of hand grenades and even more rifle grenades. The French and Russians, though not as prepared, also envisioned laying siege to German fortresses and so also had grenades. The British high command, used to colonial wars and not a general war, couldn't see much use for the things. The only grenade available was the Mark I, which had an explosive canister with a percussion fuse attached to a 16-inch handle with streamers to ensure it landed canister-down and thus detonate, hopefully in the enemy trench. The problem was that, once the pin was pulled, it was armed and would explode as soon as it struck something. 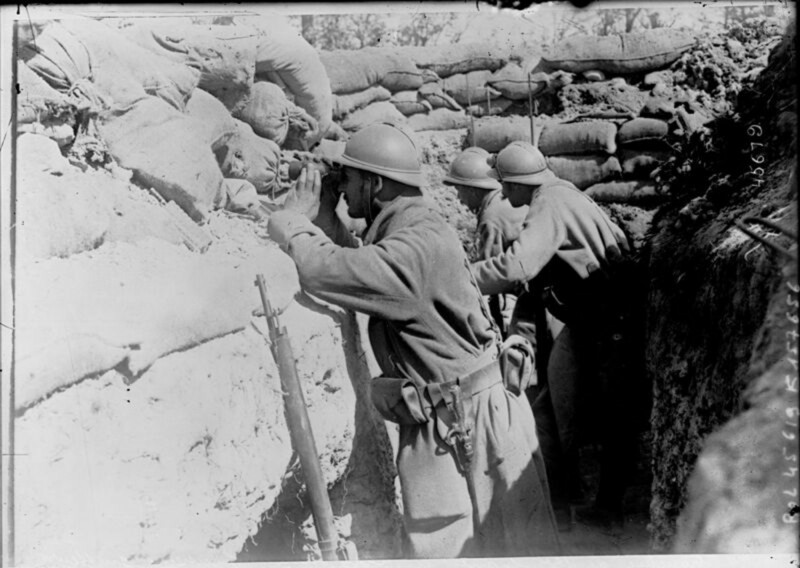 Too many times, in the confined space of a trench, that something was the rear wall of their own trench. Thus, many Tommies (British soldiers) distrusted the Mark I and engineers came up with an interim solution-- a grenade that could be whipped up at the front. 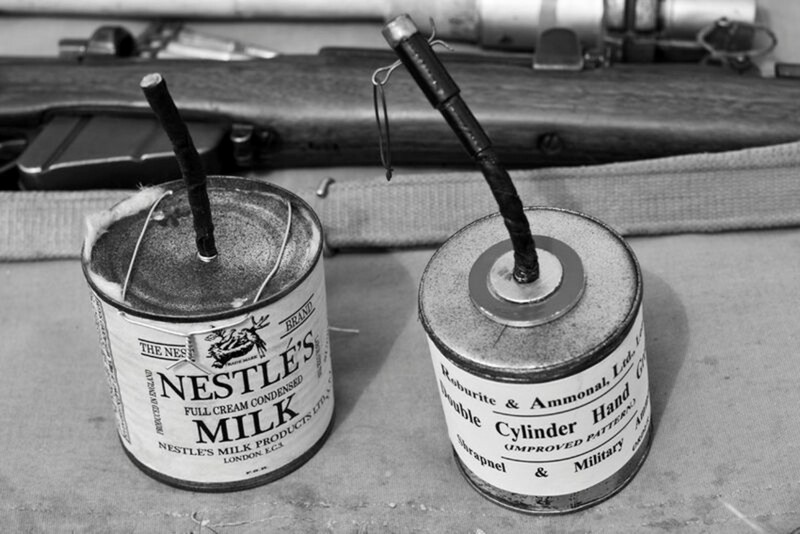 The solution was known as the “jam-tin” double-cylinder grenade, fashioned from two sizes of empty tins (cans) readily available at the front-- sometimes literally the tin containing the soldier's ration of jam. Gun-cotton or dynamite was placed in the smaller tin, which was placed inside the larger tin. Then pieces of metal, acting as shrapnel, were placed in the larger tin around the smaller. A fuse, with a burn rate of about 1.25 seconds per inch, was inserted through the lid of the outer can which was then sealed. When used, the fuse would be lit, perhaps by cigarette, and the jam-tin thrown, exploding whenever the fuse reached the explosive. 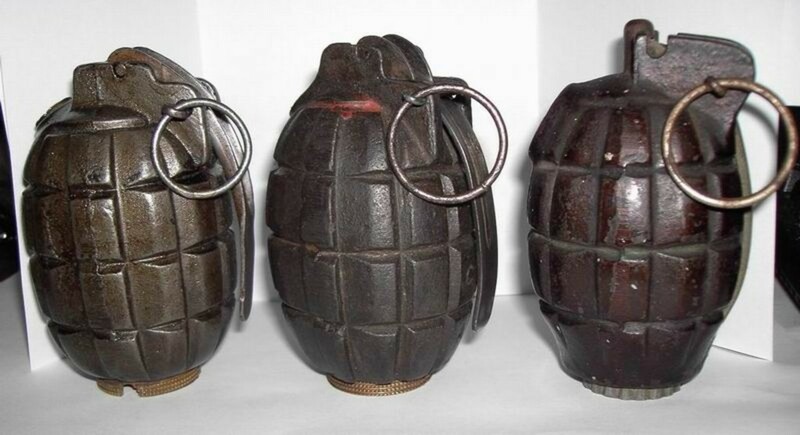 British armament companies, meanwhile, were feverishly working on real grenades, but the jam-tin filled the gap until they appeared at the front. It wasn't until May 1915, that the British introduced the Mills bomb, one of the best grenades of the war and would remain in service into the 1980s. As with grenades, the Germans were also initially armed with mortars. 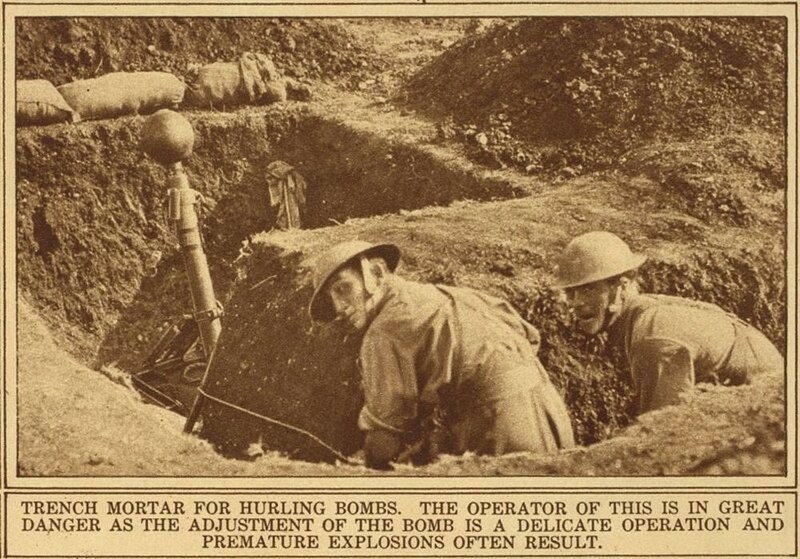 Mortars were (generally) portable and could fire unexposed from the bottom of a trench, dropping their shells into the enemy trenches with a little luck. Mortars are essentially hollow tubes angled greater than 45 degrees. A mortar shell is dropped down the tube where the base of the shell strikes a firing pin, setting off the shell's propellant and shooting the shell up, over and nearly straight down on an enemy position. Neither the French or the British had mortars at the start of the war. The French actually scrounged up Napoleonic-era mortars more than a century old until modern mortars became available. Both the British and the French also used catapults to hurl grenades into enemy trenches until mortars became available. The British produced the No. 15 “Ball Grenade” (to replace the “tin-jam” grenade, see above) with two types of fuses: 1) the 5-second fuse for throwing and 2) the 9-second fuse for use with catapults. Trench Mortar Firing a "Toffee Apple"
It wasn't until late 1915 that the British produced their 2 inch Medium Trench Mortar, nicknamed the “Toffee Apple” because its shell resembled one. Instead of dropping the mortar shell down the tube, the shaft of the toffee-apple-shaped shell was inserted in the tube and the main part of the shell (the “apple”), containing 42 lbs of explosive, stuck out the top. It was fired by pulling a lanyard, but sometimes premature explosions resulted. Later the British would develop the Stokes Mortar, the war's best mortar. 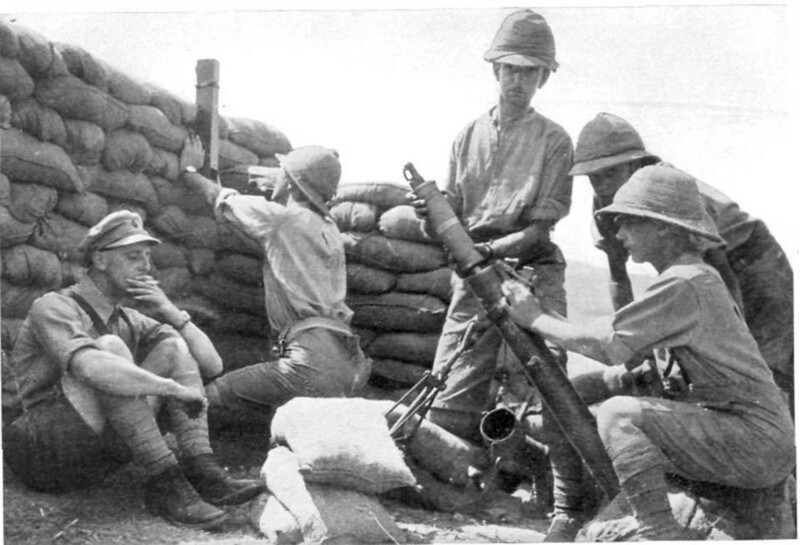 Both the British and Germans brought in elephant guns from their African colonies to penetrate armor plate. German snipers, especially, used armor shields, which protected them from normal rifle fire. British elephant guns could punch through these shields, which were generally 1/4-inch thick. By the end of 1914, snipers were the scourge of the trenches. New recruits had to be constantly told to not poke their heads over the top to “have a look”. Many were killed that way. The periscope rifle was created to allow the shooter to fire his rifle without exposing his head. A wooden frame was constructed such that it would securely hold the rifle above the shooter with the top of the periscope aligned with the gun-sites, allowing the soldier to aim by looking through the bottom part of the periscope. To fire the rifle, a string was pulled. Though not as effective as when aimed normally, it was still very useful. 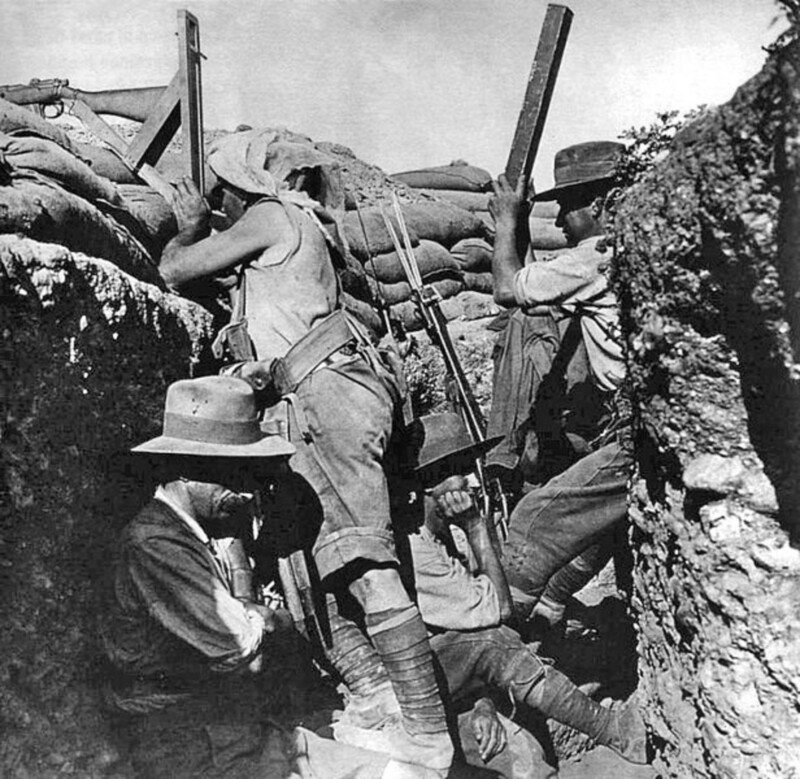 Periscope rifles were used extensively during the 1915 Gallipoli campaign, where the ANZAC (Australian and New Zealand Army Corps) were constantly overlooked by Turkish positions on higher ground. Much later in the war, when the Germans faced Allied tanks, they chose to develop anti-tank weapons and ammunition instead of tanks. 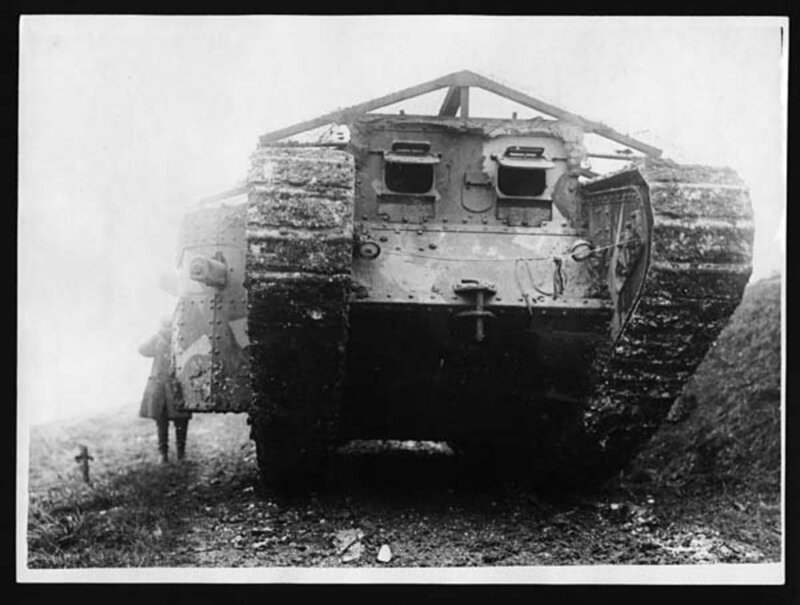 They only produced 20 tanks to the Allies nearly 7,000. The world's first anti-tank rifle was the German 13.2 mm Tankgewehr, introduced in 1918. Although it sometimes broke the shooter's collar bone or dislocated his shoulder, it was effective against the relatively lightly armored Allied tanks. When soldiers managed to get across the deadly ground of No Man's Land, the survivors had to enter the enemy trenches and fight hand to hand. Their long rifles, even longer with bayonets attached, were ill-suited in the confines of the trenches, and usually only officers had pistols. Many learned to improvise and weapons that would have been familiar to Medieval soldiers were utilized during the close combat in the trenches. Such trench raiding weapons as trench knives, trench clubs (often-times weighted with lead and studded with nails), pickaxe handles, hatchets, brass knuckles, entrenching tools, spades and maces were all used to horrific effect on both sides. American Shotgun aka "Trench Broom"
The Americans did manage to bring a gun to the melee knife fight. They adapted a pump-action shotgun for trench warfare and the Model 97 Trench Gun was so effective at clearing trenches of live personnel the Germans tried to get it banned as “inhumane”, threatening to execute any soldiers captured with one. 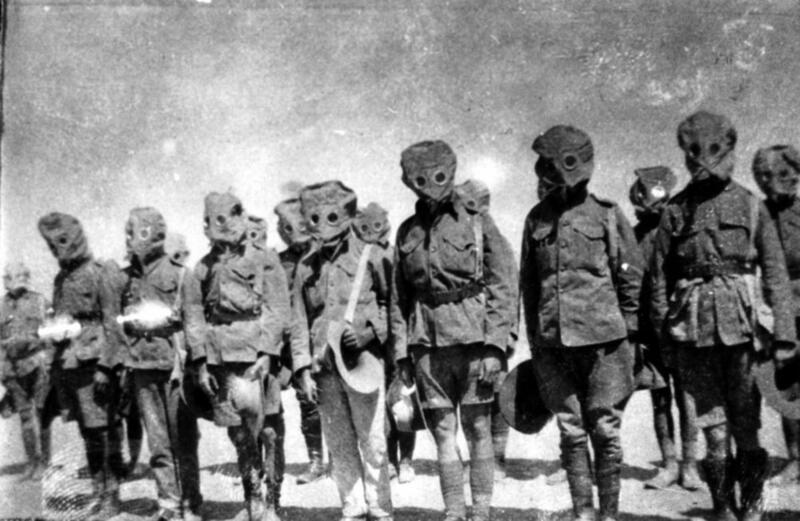 Nothing came of the threat when the Americans said they would execute Germans captured with flamethrowers or saw-bladed bayonets. There was no conscious attempt to present the weapons in a strict chronological order although in general it turned out that way. For example, German anti-tank rifles weren't necessary until tanks appeared in 1916 and Americans with shotguns wouldn't have appeared until 1917 at the earliest. 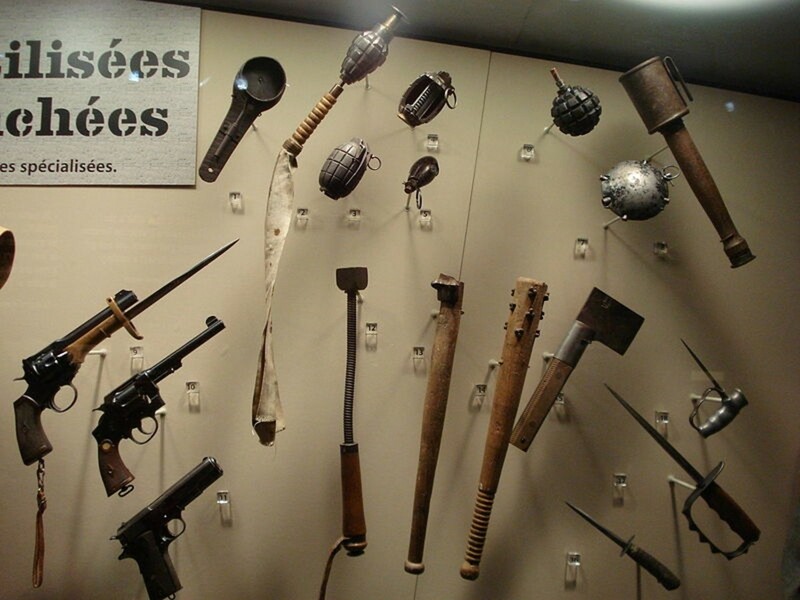 On the other hand, melee weapons would have appeared very early on when trench warfare was established. Carr, you are correct. In fact many soldiers on all sides fighting in trenches used entrenching tools as melee weapons. 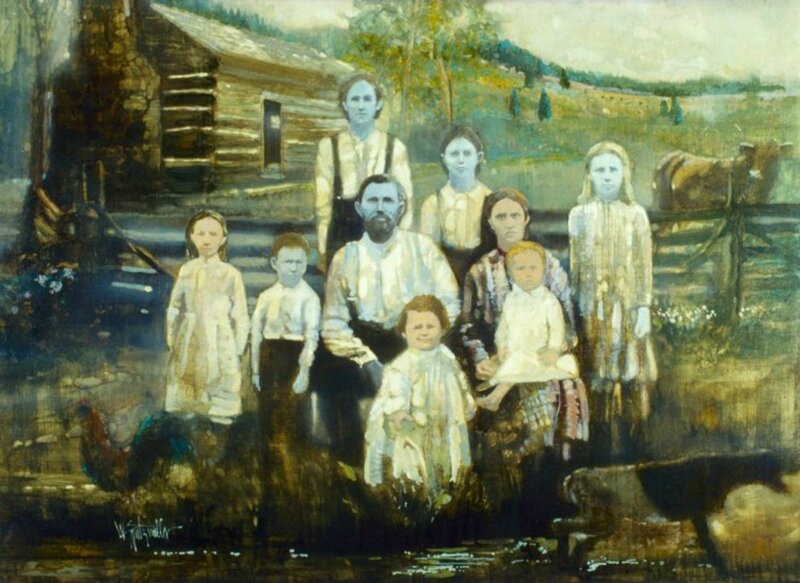 Many sharpened their shovel blades which became almost as deadly as axes. I have heard of Russian troops who specialized in using short-handled spades as effective close-quarters weapons. I can't find any information about them. I expect this was developed for trench warfare. Thanks for the comment, internpete. Always glad when someone shows an interest in history. 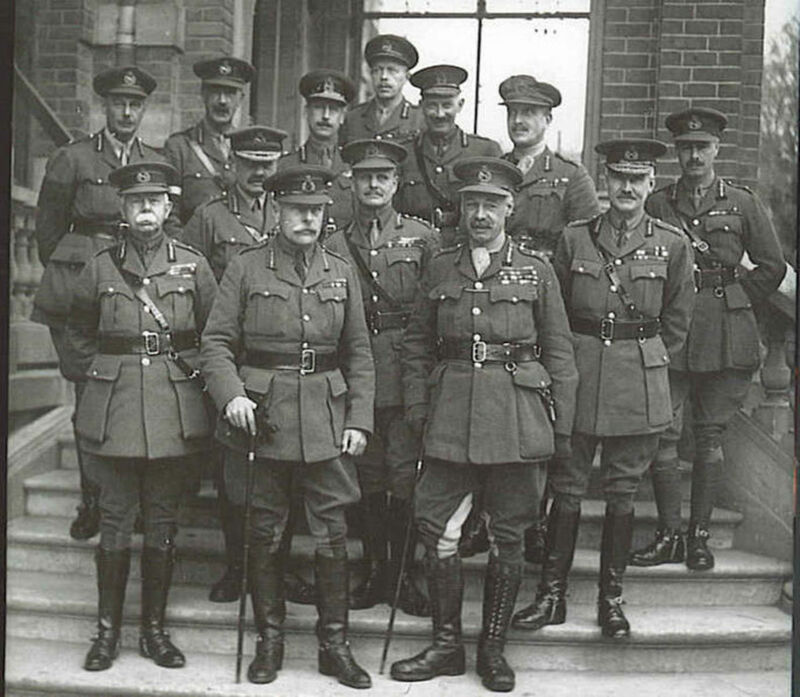 I hope you read and enjoy some of the other excellect WW1 and WW2 articles by fellow hubbers. Although I don't know a lot about WWI and WWII, I do enjoy learning about them. 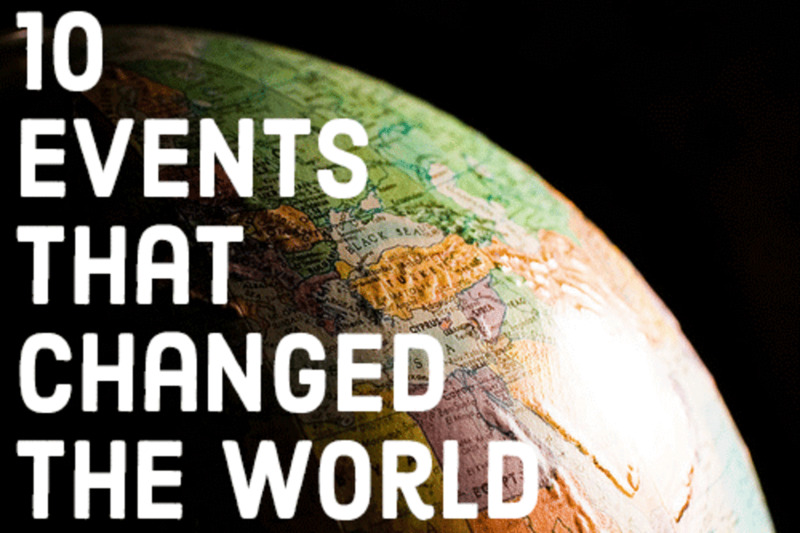 I think its important to learn about these wars. Great hub here, thanks for writing! Hi, joan. Thanks again for reading and commenting. I stumbled across the jam tin grenades and that just got me curious and then I saw the grenade catapult and knew I had to write about the subject. Can you imagine working on a farm in the English country-side, answering the call and finding yourself clubbing men to death? It's like the Twilight Zone. Very interesting, well written Hub, as usual! Voted up, useful and interesting. What a free-for-all that war was. Improvising, using obsolete weapons, and the infamous trench warfare. It's to be hoped something useful came out of it! Have a good day!